As far as public perception goes, Google is widely seen as a company that’s at the cutting-edge of the internet era, while Microsoft feels like a company that’s sort of past its prime. Microsoft had its heyday with its Windows PCs in the 90s and 2000s, but since then, Google seems to have taken over, with its slew of internet-based products around everything from email to maps to driverless cars. But Microsoft has been silently plotting a revival of its own, because it’s just leapfrogged Google to become the 3rd most valuable company in the world. On Tuesday, Microsoft’s market capitalization touched $753 billion (Rs. 50 lakh crore), and nudged past Google’s parent Alphabet’s valuation of $739 billion (Rs. 49.5 lakh crore). This helped Microsoft become the third most valuable company in the world, and pushed Google down to the fourth spot. The top two spots are occupied by Apple and Amazon, which have a market capitalization of $918 billion and $790 billion respectively. Over the years, Google and Microsoft had been regularly swapping places in the list of most valuable companies, but the last three years had seen Google had maintain a comfortable lead over Microsoft. Ever since Google rebranded itself as Alphabet in 2015, its market capitalization had been more than Microsoft’s. But that changed on Tuesday, when Microsoft pulled ahead thanks to a small surge in its stock price. Microsoft hasn’t been in the public eye as much as Google, but it’s been slowly building its capabilities in several new-age verticals. CEO Satya Nadella’s focus on its cloud computing capabilities, for instance, has made Microsoft Azure a popular alternative to Amazon AWS. As of January 2018, Azure had seen its market share in the cloud competing segment rise from 16% to 20%, while Amazon AWS’s share fell from 68% to 62%. Microsoft also leads Google in the cloud computing stakes, with Google Cloud commanding a market share of just 12%. And even on the consumer products front, Microsoft is slowly making a comeback. Its acquisition of LinkedIn has given it an entry into the consumer business, and LinkedIn also fits in nicely with its suite of Office products. Since LinkedIn’s acquisition in 2016, it’s been contributing 2.5% to the company’s overall revenues. Google, for its part, hasn’t been doing too badly, either, but its size is slowly attracting the attention of regulators worldwide. Last year, the company was hit with a record $2.7 billion fine by EU regulators for abusing its dominant position in search, and in India, it was fined Rs. 136 crore by the CCI for similar issues. This was a situation Microsoft was intimately familiar with in the 90s and 2000s — regulators were worried about its dominance in the personal computing business, and had repeatedly struck down on what they deemed to be monopolistic behaviour. But Microsoft’s struggles during its transition into the mobile era — its acquisition of Nokia saw it write off a record $7.6 billion off its books — meant that even as the company faltered, it escaped the gaze of regulators and the critical press alike. In the meantime, Microsoft has doubled down on businesses that it saw as its core strengths, and its stock price now reflects the turnaround. 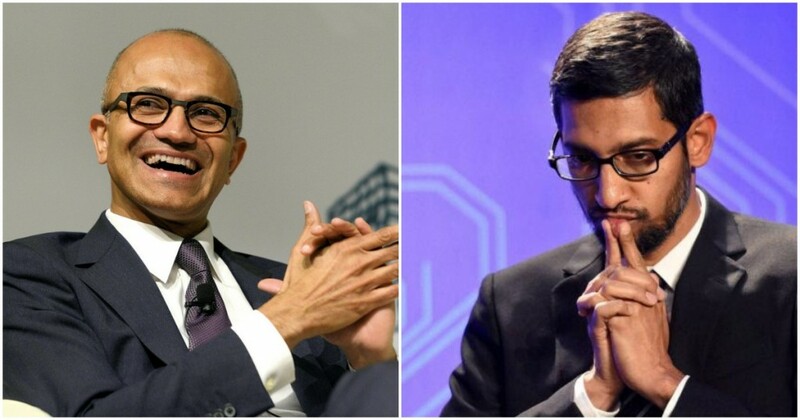 Microsoft and Google as still neck-and-neck in terms of market capitalization, but Microsoft has shown that as far as the race to become the first company to reach the $1 trillion valuation is concerned, its hat is very much in the ring.